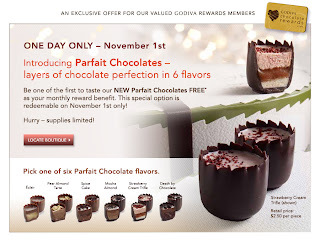 A Day Late and A Dollar Short: Godiva - Parfait Chocolate **FREE** on November 1! Godiva - Parfait Chocolate **FREE** on November 1! Are you a member of Godiva's Reward program? If so, you can visit your local Godiva Boutique on 11/1, and request a **FREE** Parfait Chocolate! Visit the Godiva website to join the Godiva Rewards program or to find a location near you! Enjoy!